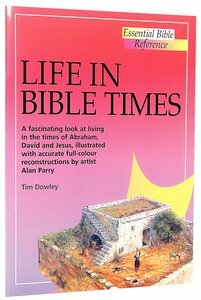 Illustrated in full colour throughout, this absorbing book is full of fascinating facts about the way people in the Bible lived. You'll discover everything from what Jesus' home would have looked like to methods Dr Luke would have used to treat his patients. About "Life in Bible Times (Essential Bible Reference Series)"
What did the Nazareth house of Mary and Joseph look like? What tools didoseph the carpenter use? What sort of boat did fishermen Peter and Andrewail? This work offers answers to these and other questions about life inible times in words and pictures in this illustrated book.